When eating a low carb diet, there are only so many cuts of meats, eggs, and high protein foods you can eating without craving some of your favorite foods. While pancakes used to be a big “no, no”. These cakes will help you stay on your low carb eating plan without adding in the extra carbs. Use this easy recipe for no carb pancakes and you’ll be on your way to satisfying your cravings without packing on the extra water weight and fat. Put all the ingredients into a blender or Nutri Bullet. Blend all ingredients until the contents are smooth. Let the mixture stand until all the bubbles have dissipated. Heat ghee, or MCT oil in a pan. Pour 1/4 of the mixture into the hot pan and cook until golden brown. Serve with sugar-free syrup or low carb jam. These no carb pancakes are fast, easy, high protein, and healthy! They take less than 10 minutes to make and they are deceivingly delicious! Feed the cravings, starve the fat! 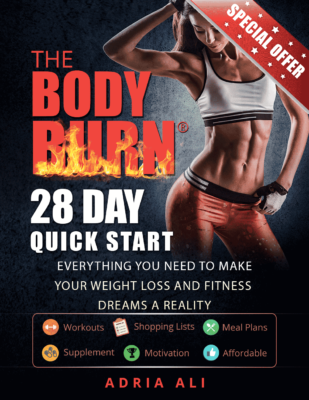 If you love this recipe, then you’re going to love our new program, The Body Burn 28 Day Quick Start! Full meal plans, recipes, shopping lists, and workout routines! Created by LA fitness professionals to give you results FAST. I'm 59 yrs old, weight about 167.3 pounds Hight 5'3. And I will like to eat the proper way to lose about 37.3 or 32.3 pounds. Please published a good menu for an entire month or 3 mounths.. Thanks I will appreciate. Zandie. .
Zandie, we are working on releasing a cookbook BUT 3 months meal plans are a bit out of our reach right now due to time constraints. I made these today and they were great. I doubled the recipe for my husband and I. I covered mine in raspberries and strawberries and a few slices of sugar free bacon. I feel satisfied without feeling gross like I used to feel after eating a pile of pancakes. Thanks!! Courtney, Thank you for your comment! This is just one of the many meals that we've included in our new "Body Burn 28 Day Quick Start." SO if you love this one you're sure to love our digital book! When you have time, wander over to bodyburnllc.com to see how you can get your copy free! Do you think including a tablespoon of peanut butter would be okay? I am not sure if it would change the thickness. I would start smaller, say one teaspoon. Then see how thick they come out. Great to hear! Thanks for sharing it with the Fit Tip family! I am in love with these. I can eat pancakes with no guilt... And carbs! So easy to make. Awesome! Thanks for commenting Steph! I made this morning and I loved them!!!!! They looked just the picture! The trick is to keep them on the smaller side. Will definitely be making these again! Thanks for sharing Shelly! Glad you liked them and thanks for sharing your tips! Getting ready to try these this morning...they look delicious. Could you please define MCT oil? Thank you! Forgot to check mark the following w up response box. “MCTs” are medium-chain triglycerides. I choose to get my MCT oils from the bulletproof brand because I believe in their processing. Two ounces of cream cheese has 4 Carbs. If you are on a restricted carb diet you need to add these in. I don't understand how this is a no carb recipe? Can these pancakes be made and frozen to eat for later?